Beans on Parade comedy show: 6 and 8 p.m., ArtSpace/Lima, 65-67 Town Square, Lima. Doors 30 minutes prior. Tickets $10 at https://brokendrift.ecwid.com/Tickets-c23280095. 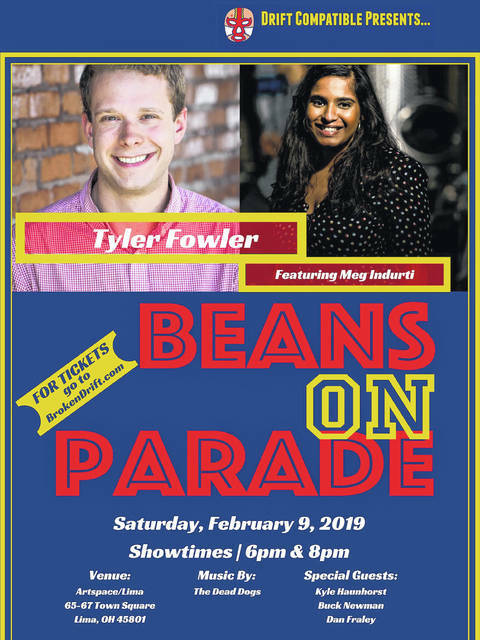 LIMA — Beans on Parade, a live comedy show presented by Drift Compatible Productions, will be at 6 and 8 p.m. Saturday, Feb. 9 at ArtSpace/Lima, 65-67 Town Square. Chicago comedian Tyler Fowler will headline the comedy special along with Meg Indurti. There will be standup from Kyle Haunhorst, Buck Newman and Dan Fraley, and a musical performance by The Dead Dogs. Tickets are $10 at https://brokendrift.ecwid.com/Tickets-c23280095. Doors open 30 minutes prior to each performance. Concession proceeds will be donated to the Southside Spartans, a local nonprofit that offers young people, ages 8 to 18, a drug- and bully-free gym for championship level coaching in boxing. Tyler Fowler’s witty and clean brand of stand up comedy has made him a favorite around Chicago and across the US. Regularly appearing at Zanies Comedy Club, Riddles Comedy Club and The Comedy Clubhouse he was recently named among the ‘Best Of The Fest’ at the 2018 Cleveland Comedy Festival. As a co-founder and producer of Chicago collective Team Us Comedy, he produces a number of the Windy City’s favorite shows including Cocktails & Humor and Laugh Near Minimalist Furniture. Friends since high school, Newman and Haunhorst have been encouraging and supporting each other’s stand up for nearly a decade and after years of traveling back and forth to perform with each other, they made the decision to put on their own show. “We want to build the production with as many Lima Beans as possible so we can bring more shows and opportunities throughout the region and take these Beans on Parade,” said Buck Newman, co-founder of Drift Compatible Productions. Newman is a writer and standup comedian, the cofounder of Drift Compatible Productions, and Producer of the Big Pine Comedy Festival which recently took place in Flagstaff, AZ. He also drives a minivan to stay humble. “We consider this show to be our first step towards reintegrating with the entire Lima community and giving back to the people and places that helped raise us,” said Newman. Kyle Haunhorst graduated from Lima Central Catholic in 2003 and now resides in Cleveland. He is a brash yet lovable comic. Recently, he has been competing in comedy roast battle shows as an insult comic. He participated in the Big Pine Comedy Festival, is the former Ad Hominem Attack Show champion, and competed on Roastmasters at The Stand in New York City. Haunhorst is also a Cleveland Comedy Festival board member and runs Not Your Parents Basement, an independent comedy club in Cleveland.